My ten year old son went to “work”. 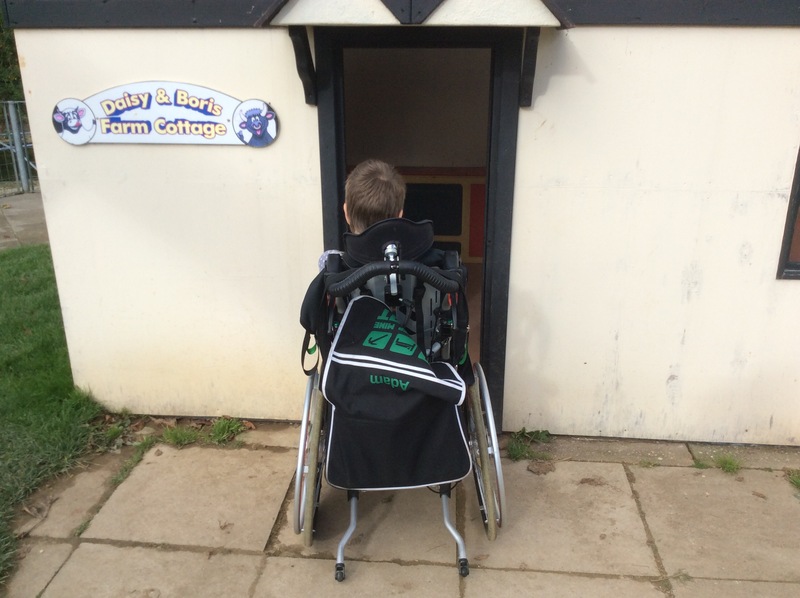 He wants to visit places, to check out how accessible their toilets are and give them some information about how to improve them. 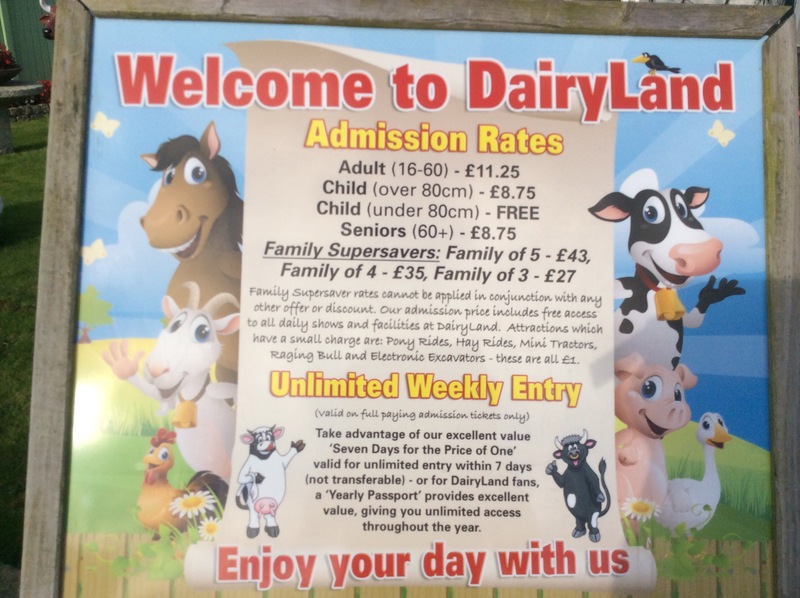 Today he chose Dairyland Farm World near Newquay. I reminded him that we could only stay for an hour and I reminded him that it was not going to be a perfect day out. I needed to be sure that he understood. When you can only stay an hour you need to check out the schedule of the day at that attraction and pick the hour you will get most from. I wanted there to be something good for him, despite the “work” aspect. 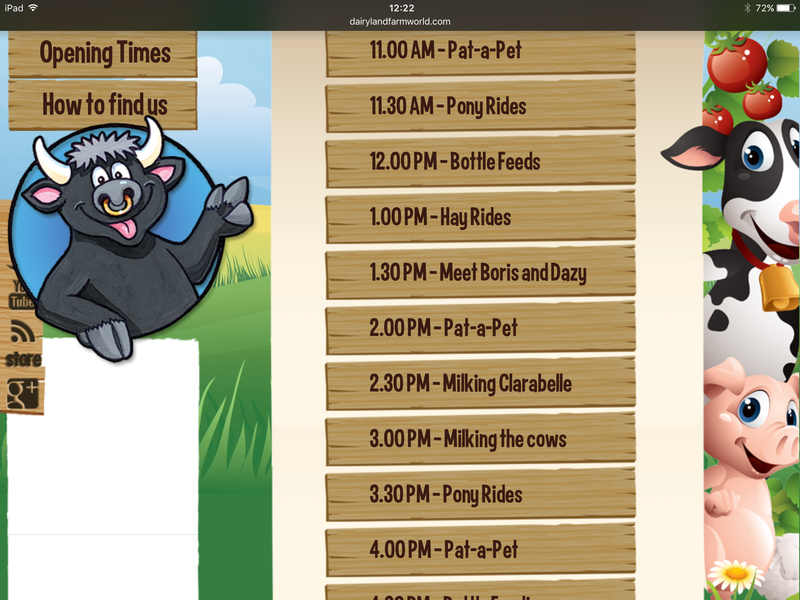 We decided to go for 2pm, Pat-a-Pet, as I knew from experience that it is an accessible activity. I can’t get him on a pony or on the hayride and the bottle feeding area was likely to be hectic during half term week. So we chose to avoid those things. We arrived just before 2pm and headed straight to the Pat-a-Pet area. Everyone sits in a line on haybales. I placed Adam as close to one end as possible and the young man announced that he would start a rabbit at one end and a guinea pig at the other. Despite being on one end, no animal came to Adam but was passed to the first child on the haybales. I am so very grateful to a lady standing nearby who was clearly stunned at the way Adam was missed. She explained to the children sat on the hay bales that Adam had been missed at the start and asked if it would be okay to take the rabbit to him for a moment. Children are wonderful. They immediately see what is right and were happy for her to do so. I don’t think the staff member intended any hurt, he was young and I suppose there is a possibility that he might have been told that children must be sat on the bales. 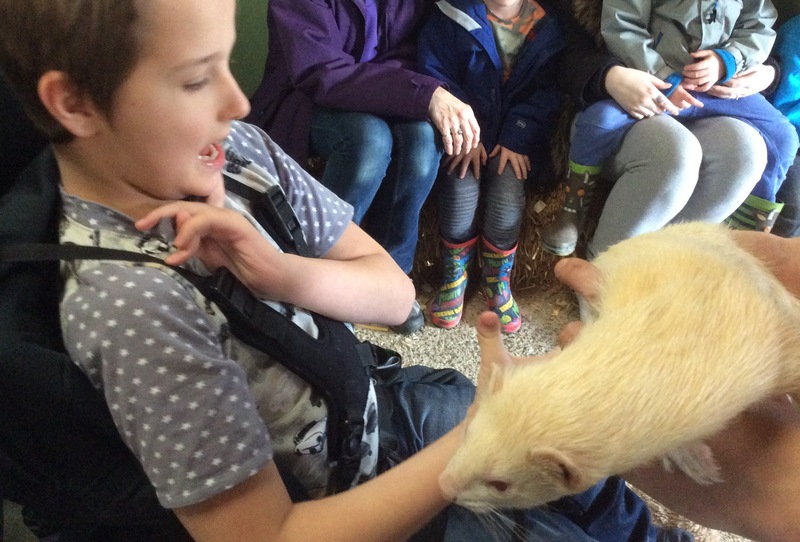 Adam petted the rabbit and a guinea pig and enjoyed chatting to a ferret. Adam was most excited to see the playhouse outside. He had loved playing in it when he was smaller, when I used to lift him and carry him inside. Sadly, the door was too small for him to get in but he settled for looking in the window from the outside. 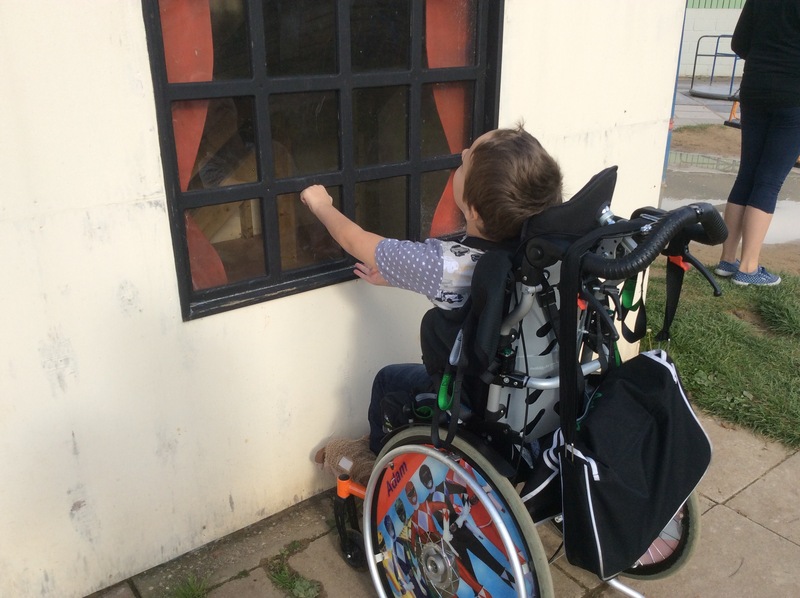 Some days that feels like the story of his life – being outside, looking in. But he made the best of it, which is something which makes me proud but also sad, for he doesn’t expect to be able to play. 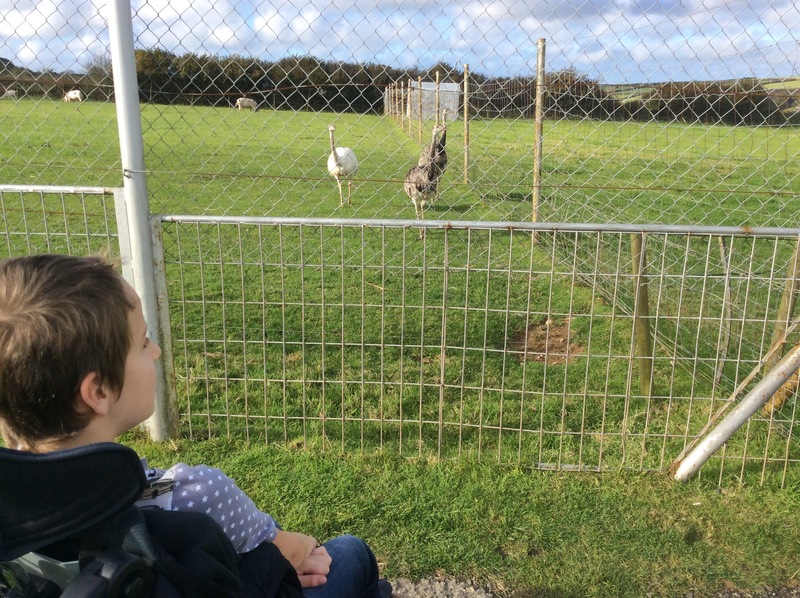 We did enjoy looking at the animals though. We saw cows, sheep, ponies, donkeys and even alpacas. 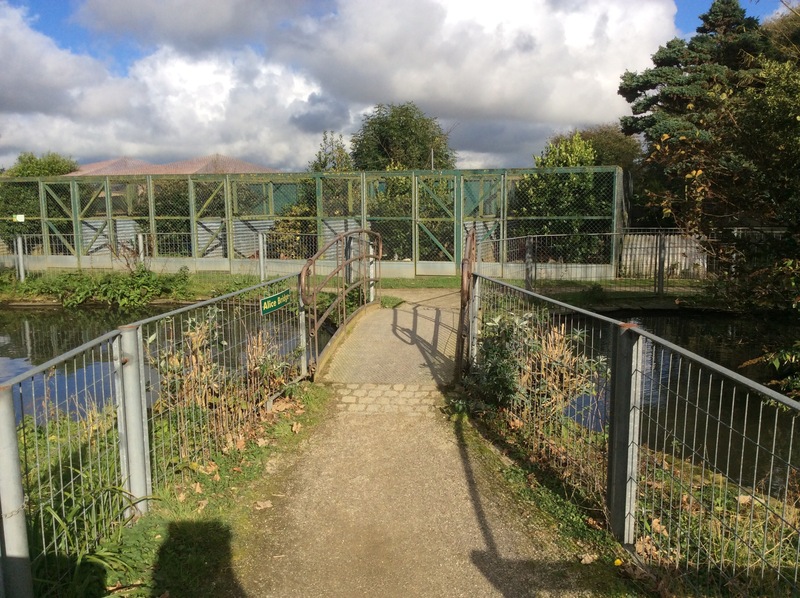 Paths were wheelchair accessible and we did like going over the little bridge. By now we were reaching the point where we were likely to need a toilet in the next half an hour or so – I certainly was! So we handed in his letter and the information we had brought and headed home. 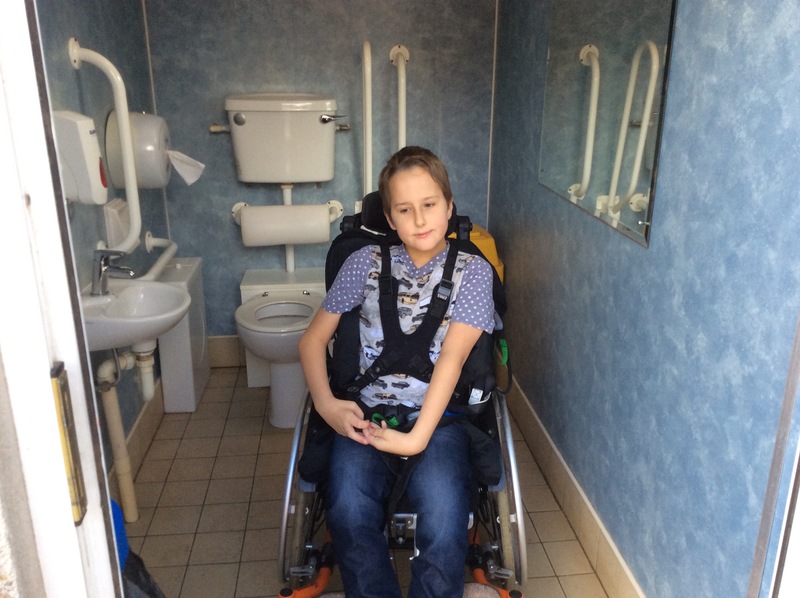 Even if we had brought his toilet chair and mobile hoist it would not have been possible to use them in the current “disabled” toilets. There is another toilet block in the car park with more toilets for all and another “disabled” toilet which we couldn’t use either. On the whole, I found it a tough hour. It was really hard for me to be somewhere so filled with reminders of how inaccessible the world is. But Adam enjoyed it and he wants to go back! He enjoyed seeing the animals and it was a shame to leave when we had only explored a small part of what is available. Had there been an accessible toilet we would have arrived earlier and stayed all day. We would have enjoyed lunch in Clarabelle’s Kitchen. They always served good food and Adam used to love their tasty strawberry milkshakes. As it was, I was quite desperate to get home to use the toilet. They had plenty there which I could use, but how can I be comfortable when my son cannot? Previous: Previous post: Afraid to go out. Next: Next post: Disney will be magical again! Oh, it looks like Adam really enjoyed it, despite some of the challenges. Hopefully, when you share this post with them, they will consider some of the facilities and the inclusion for all (even if it wasn’t intended to exclude). Hoping so. I don’t want them to see it as criticism but as a starting point to becoming more accessible. Great review of an attraction through Adam’s eyes. Keep up the good work. It really isn’t nice. This equipment is needed by hundreds of thousands of people in the UK alone. The Equality Act is supposed to be anticipatory but nobody will follow it till there is a legal challenge. Glad Adam still had fun and wants to go back despite the challenges. He has an amazing way of enjoying the moment. Although sometimes that makes me sad as I know he does it because he has to.